A fine turntable that seems to have slipped down the back of the sofa, so to speak, Pioneer’s PL-600 was extremely impressive when it came out in 1979. Streamlined and futuristic, it was a generation ahead of the company’s previous record players. 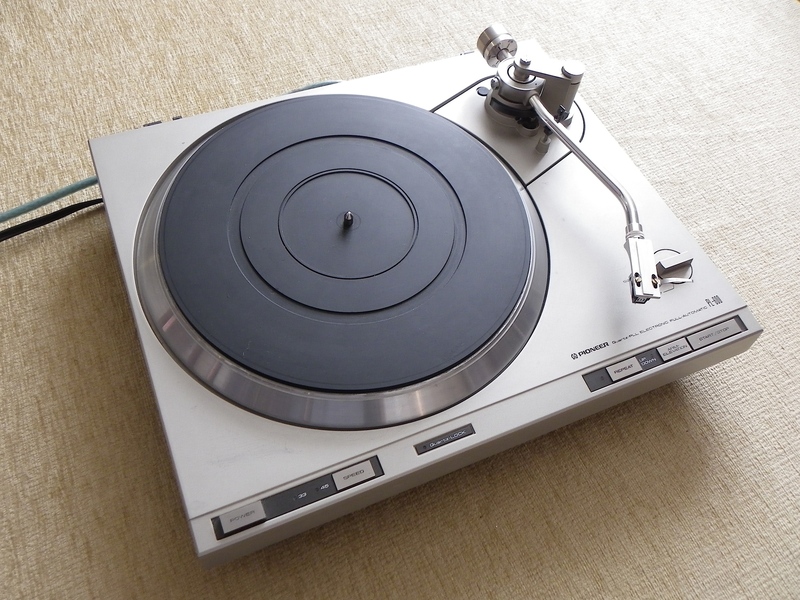 It was the top conventional turntable in Pioneer’s 100 series range which kicked off with the PL-200, a good quality but basic semi-automatic direct drive turntable; the £130 PL-300X introduced the company’s new Stable Hanging Rotor Quartz-PLL DC motor for greater speed stability and accuracy over time. But perhaps one of the most important features it boasted – and something it shared with the rest of the range – was its coaxial suspension. The PL-200, PL-300, PL-400 and PL-600 all looked like they were solid-slabs, but actually had a well concealed independently sprung suspended subchassis under the skin. Unlike its rivals, what looked like the champagne gold painted aluminium top plate of plinth on the 100-series Pioneers was independent of the turntable base, which was made from pressed steel and painted black. It was connected by four springs, themselves damped by foam. The platter and tonearm sat on this sprung subchassis too, so vibration coming into the deck via the air – picked up from the plinth or dustcover, first had to travel through the springs to get to them. It was a great system and worked well when properly adjusted so the deck bounced up and down freely and evenly. At 456x140x384mm, it’s one of the smallest quality Japanese direct drives around, but still weighs nearly 12kg. From its silky tonearm to that heavy 330mm diecast alloy platter, it makes the already impressively crafted Technics look cheap. Everything from the optically triggered, non-contact tonearm drive motor to the microswitch controlling the lift-lower cueing motor are of the highest quality; the bearing housing is a robust alloy casting which encloses a finely machined spindle. The turntable drive motor is silent and strong; this brushless, slotless linear design has a phase-locked loop quartz circuit that keeps wow and flutter down to 0.02% WRMS and noise back to a claimed -78dB. The PL-600 sounds powerful, punchy and musical, yet has satisfying smoothness and depth. Deft at capturing leading edges of the notes, struck steel guitar strings sound more lacerating than via a good belt drive deck, but is how steel string guitars actually sound. The deck has a wonderful clarity in some respects, most apparent in the midband. You can hear it at the low end too; bass guitar notes are satisfying to behold with vice-like bass grip, making even the excellent Michell GyroDec (belt drive) sound loose and lackadaisical. The music is more propulsive; there’s a greater sensation of a direction of travel, rather than just ambling around. This translates to the treble too; there’s a clarity that’s especially telling on ride cymbals. It’s not the best deck in the world, suffering from a narrower soundstage than is ideal, and the mediocre tonearm wiring gives a tonally grey sound too. But still the Pioneer PL-600 has an unflappable nature that invests everything it plays with a sense of solidity – yet it never sounds overpowering or in your face. It makes the deck extremely listenable; no matter what music you play on it, this deck turns in a highly satisfying performance. Because they’re built so well, many have lasted. PL-600s aren’t plentiful, but surface for anything from £50 to £300. Confusingly in Japan, the PL-600 was sold as the PL-120, and in the USA, the PL-600X was an altogether different turntable; so make sure you’re certain what you’re buying. Cheaper decks in the series go for peanuts; a PL-300X can be had for under £100, and will still turn in a very nice sound. If the deck you view is droopy and its platter won’t bounce energetically up and down like a nodding dog, then some surgery will be required to get it back to its best; it will need stripping, new springs sourcing and fitting and then rebuilding. This is something hobbyists can do easily, but isn’t something for the kitchen table when you have a spare fifteen minutes! Properly set up with a decent cartridge, and any Pioneer PL-100 series will delight, giving superb sound per pound.